Dyno testing is the final step prior to installation in the car. 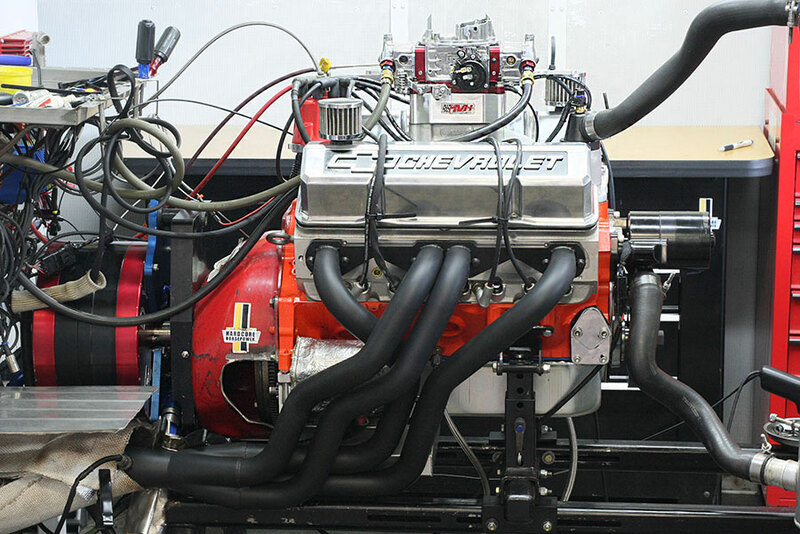 Here, a 300-mph, 1,400-hp twin turbo small-block Chevy endures the break-in process at Mike LeFevers’ Mitech Racing Engines facility in Placentia, California. Initial engine startup and break-in procedures are vital to the success of every new racing engine. Many top engine builders treat initial startup and break-in with nearly the same respect as with a NASA shuttle launch. 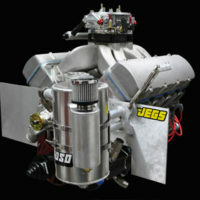 Countless hours of prepa­ration and a substantial amount of money have been invested to build the best possible engine. Engine maintenance includes appropriate initial starting proce­dures at each event. For example, even a used engine benefits from pre-heating and pre-oiling prior to the first restart at a new event. Some builders take great pains to keep the engine and the oil warm (at least 140 degrees F) at all times so the engine is never started cold. If you subscribe to the theory that all of this is beneficial to long-term performance, you’re exactly right. You can never do enough to support the precision assembly of parts in any racing engine. Initial startup is not the time to rush. Each engine is a precision assembly of expensive components fit together with critical operating clearances. Although every effort has been made to ensure the integrity of critical component relationships, innumerable things can go wrong in an instant if proper care is not exer­cised. This sort of thing often hap­pens when you get caught up in the rush to hear it run. 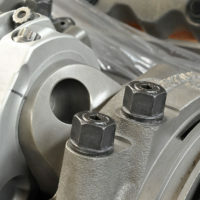 To ensure consistent results, it is advisable to establish a univer­sal checklist that can be applied to every engine. This guarantees that you don’t skip crucial steps that may affect the component health of your engine and ultimately its real world performance potential. Numerous checks and verification's must be performed prior to initial engine startup. Many of these steps will not be required once you establish the engine’s operational well-being, but they are critical to preventing unexpected damage when you first fire the engine. Some of them also address the important issue of ring seating during those first few critical moments of engine operation. The first line of defense against initial startup damage or follow-on damage during the engine break-in period is the use of proper assem­bly lube during engine construc­tion. High-pressure engine assembly lube is favored by most professional engine builders although there are still diehards who only use engine oil on everything except cam lobes. Most builders use high-pressure lube on bearings, lifters, pushrod tips, rocker arms, and (on most) bolt assemblies to ensure proper torque and bolt stretch. Others favor straight engine oil or automatic transmission fluid (ATF) on the cylinder walls for assembly and they coat piston rings and skirts with engine oil. Some builders still use assembly lube on piston skirts, but oil is perfectly ade­quate especially now that many pis­tons are prepared with coated skirts. High-pressure lube is also appropri­ate on wrist pins and many builders approve of it for coating oil pump gears and the distributor drive gear as well. Proper assembly lubrication is essential to prevent engine damage upon initial engine startup. This includes assembly lube, cam and lifter lube, engine oil break-in supplement, and valve train assembly spray, among others. 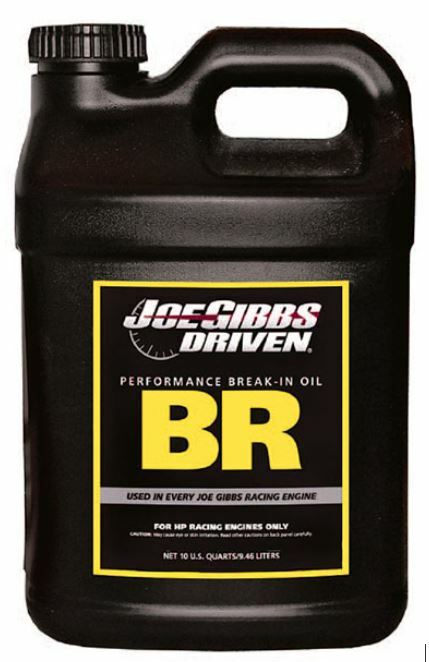 Quality break-in oil with high zinc and phosphorous content is essential for proper engine break-in. Do not attempt engine break-in with off-the-shelf regular or synthetic motor oils that are not formulated for the high-friction environment of initial engine startup. Modern high-pressure lube is vitally important for the initial break-in of flat-tappet cam lobes. Flat tappets have virtually vanished from most modern production engines, hence commercial motor oils are no longer formulated with the critical friction inhibitors that provide pro­tection to sliding components expe­riencing high-contact loads. Older motor oil formulas used a high zinc content to provide this protection. Modern oils don’t use it, primarily because it damages oxygen sensors and throws production cars out of tune. Fortunately most racing lubri­cants and break-in oils are formulated with high zinc and phosphorous contents to resist friction damage between sliding components. Break-in oils are expensive, but they have largely displaced additives used to supplement conventional motor oils. They include ingredients expressly designed to protect engine bearings and promote ring seating during the critical break-in process. Many of these oils emerged from the early break-in practices of Pro/ Stock drag racing and other venues that began using oils formulated for severe-duty diesel engines that are vulnerable to high-pressure fric­tion conditions. Shell Rotella T was a favorite for many years as were Mobil Delvac 1300 Super, Castrol Tection Extra, and Chevron Delo 400—all 15W-40 multi-grade Diesel engine oils. 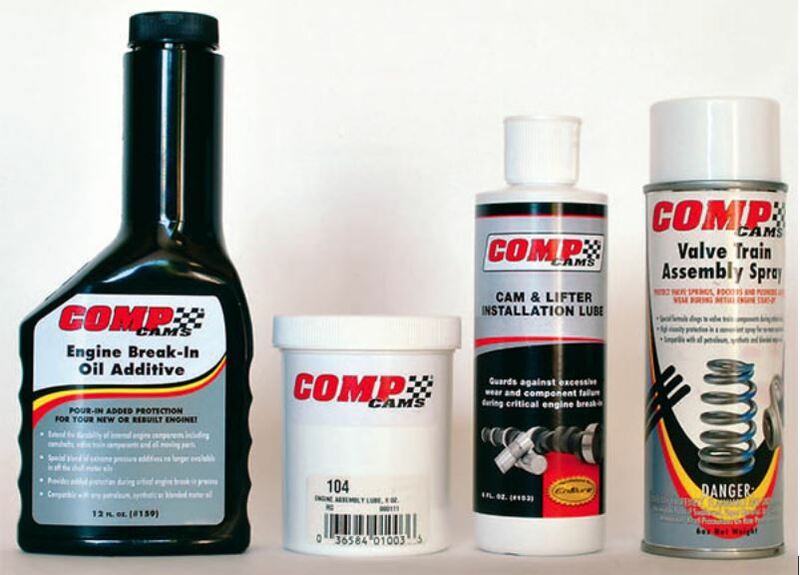 Performance suppliers like Comp Cams, Joe Gibbs, and Red Line now offer similarly formulated break-in oils specifically for race engine use. Once the engine is properly broken in, racers can switch directly to their preferred synthetic engine oil with complete confidence. Precautions are especially neces­sary to prevent damage to flat-tappet camshaft lobes during initial startup. Valves pring pressures designed to support high RPM are excessive for the initial contact and break-in period. Even with high-pressure lube coating the cam lobes, it is possible to wipe out cam lobes during the ini­tial fire-up session. Solutions include substituting lower-rate break-in springs for the initial break-in. 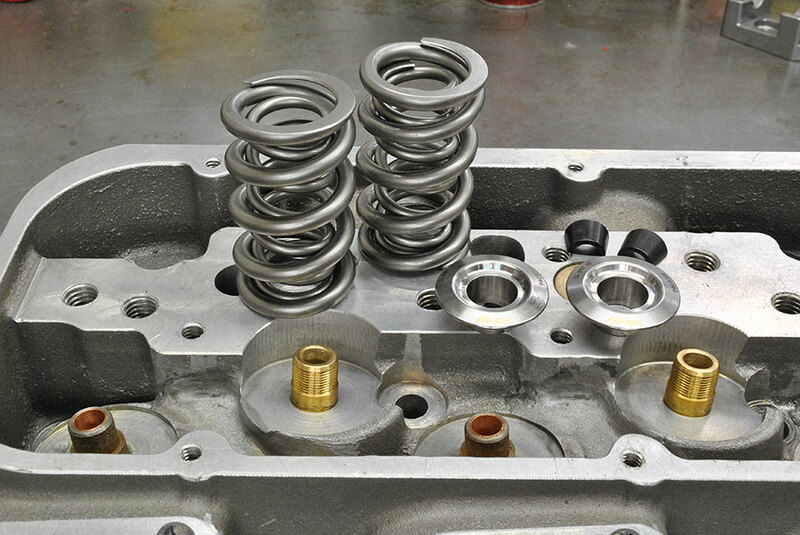 Depending on the application, some builders feel it is sufficient to remove the inner valve springs from multi­ple spring packages for the break-in period. To ensure success with this method, it is necessary to further quantify the startup spring pack­age on a spring tester. Since startup and initial break-in procedures rarely exceed 3,500 to 4,000 rpm, it is safe to employ springs that provide ade­quate operational pressure, but not so much that it wipes out cam lobes. About 100 pounds on the seat usu­ally suffices. If removing the inner springs from the spring pack proves to be insufficient, try using the outer springs only from a well-used spring set that has substantially less spring pressure. Once you have completed the break-in process you can install the correct spring package designed for your camshaft without conse­quence. Because of the very high spring pressures used on some mod­ern cams, many engine builders rou­tinely run break-in springs even on engines equipped with roller cams. They don’t want to over-stress the roller axle until it has been fully lubed and has some operational time on it. 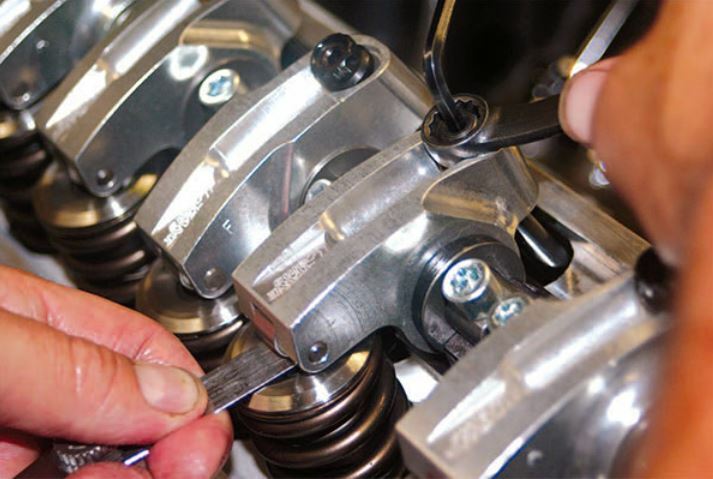 Comp Cams sells low-ratio break-in rocker arms (1.2:1) for small-block Chevys. The low-rocker ratio minimizes valve motion and protects the cam from exposure to excessive spring rate on initial start-up. Engines run just fine with these rockers for break-in. 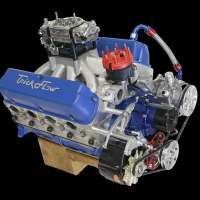 Comp only makes them for small-block Chevys, but in some cases you may be able to identify a lower-ratio rocker that works temporarily if you have a different engine. If not you can use the valve spring substi­tution method. Low-ratio rockers work by limit­ing valve motion to the point that the spring never approaches full compression thus placing minimal load on the cam lobe to lifter inter­face. While these rockers permit the engine to run smoothly at lower engine speeds, it is important not to overload them. Always change back to the correct springs and rock­ers immediately after a break-in ses­sion and verify that all components have been switched out prior to run­ning the car or tuning the engine on a dyno. Failure to do so may cause damage to the cam or valve train if you exceed the safe engine speed. Even if you only damage the break-in components, some metal will likely deposit in the engine and eventually circulate to the bearings. Consider 3,500 to 4,000 rpm the red line when working with specialized break-in components. While exact valve lash is not absolutely critical during break-in, engine components do expand with heat and valve lash typically increases. As a rule you can set the lash .002- to .004-inch tighter on engines with iron blocks and alumi­num cylinder heads. You can close it up even more on all-aluminum engines, which tend to grow consid­erably more with temperature. Don’t overdo it, but the lash should grow into the correct clearance range for your particular valve train. When you perform the first check after warm-up you should find all lash settings rela­tively close to the specified clearance. If running break-in springs, ini­tial lash should be close to what you will eventually run. Watch it closely to make certain it doesn’t tighten or loosen excessively, which indicates a problem. While rarely used in true racing engines, hydraulic lifters are sometimes specified in lower sports­man classes. Here it is important to establish proper lifter pre-load so the lifter absorbs dimensional changes as the engine gains temperature. Typically zero-lash plus 1/8 to 1/4 turn down on each lifter provides the desired pre-load to absorb thermal growth and prevent lifter pump-up later when the engine is run under full power. At this point it is wise to mark each pushrod with a vertical line (white or silver marker on the dry surface) to track pushrod and lifter rotation with flat-tappet cams. If the lifters are rotating properly all the marks have rotated to different posi­tions during engine warm-up. If they haven’t moved, investigate thor­oughly before you go any further. Some builders using deep-sump oil pans like to add an extra quart of oil for break-in, thinking it pro­vides additional splash lubrication to the cylinder walls, but the practice is generally self-defeating. If the cyl­inder walls, pistons, and rings were properly lubricated during assembly it is generally unnecessary and may actually inhibit ring seating due to excessive lubrication. The only time you might consider it is if the engine had been stored for an extended period prior to startup. Even then it is largely unnecessary and most builders simply squirt some light oil through the spark plug holes prior to starting. Some builders find it comfort­ing to pull the pan after break-in to clean out any trash that may have accumulated (not that any should) and to take a look at the bearings. With a wet sump system it is best to pre-fill the oil filter and then pre-lube the engine using a sturdy 1/2-inch drill motor and the appro­priate oil pump drive rod until oil is confirmed coming out of every rocker arm. Dry sump systems require pre-lubing to ensure that the pressure line from the pump and all internal oil passages are full. Then the proper level in the supply tank can be estab­lished.For the initial start-up remove the drive belt from the pump and give the engine one final pre-lube just before starting. Then closely monitor oil pressure and oil level in the supply tank during warm-up and cam break-in. Be sure to pre-lube the pump with a light coat of high-pressure lube during installation. Some engine builders running iron blocks and iron cylinder heads place small engine magnets in the lifter valley and the cylinder heads to catch errant metal debris that may be floating in the oil supply. These mag­nets also capture microscopic metal (ferrous) particles and can provide additional wear protection depend­ing on the source and severity of the contaminants. 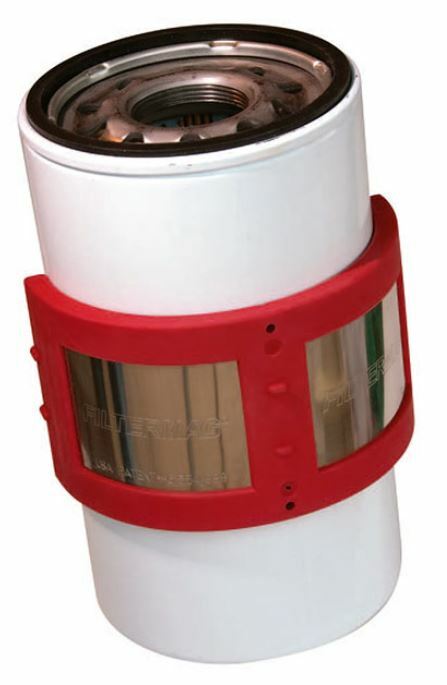 A Filtermag attached to an engine’s oil filter is strong insurance against engine damage from dislodged or undetected metal particles in the oil supply. Every race engine should have a Filtermag attached to the oil filter. This draws any ferrous metal particles to the edge of the filter can where you can easily judge their importance when you cut open the filter after break-in. Using magnets is a detail that is frequently overlooked, but it is difficult to see how they could do any harm. Even if you remove them after engine break-in, you still have the benefit of their protection during the engine’s initial run-in. Some build­ers don’t believe in magnets and feel it is sufficient to practice strict clean assembly procedures and keep a sharp eye out for metal during the first inspection after engine warm-up. In my experience, this practice is accept­able because precision assembled race engines rarely shed much metal. Post-startup oil changes used to be favored because builders expected to find a certain level of trash left over from assembly. Proper clean assembly techniques dictate that this shouldn’t occur and that you should be able to run the break-in oil and filter for the entire break-in period. Adjust the engine’s initial tim­ing and fuel delivery so that it fires instantly or with very minimal cranking. A favored tactic is to rotate the engine by hand to about 25 to 30 degrees BTDC, then adjust the crank trigger or the distributor reluc­tor so the engine fires at that point with the distributor locked down. This provides sufficient advance for starting and warm-up prior to initial inspection. Perform all of your checking for WOT prior to filling the carburetor with fuel. Once the bowls are full every little throttle movement sends a small shot of fuel into the plenum. Most new engines fire on one mod­erate pump shot of fuel just before you hit the starter. You should easily be able to start the engine and take it right to the desired break-in speed (typically 2,000 rpm) in only a few seconds. After the warm-up, cam break-in (if required), and initial inspection, you can readjust the timing to your anticipated base setting prior to fur­ther break-in and certainly before beginning initial torque checks and final tuning procedures. Fill the engine with the appro­priate amount of break-in oil. Make certain to use one of the quarts of oil to pre-fill the filter depending on how the filter attaches to a particular engine. Immediately prior to initial engine startup, pre-lube the engine for 3 to 5 minutes, or longer if nec­essary. Do this by spinning the dry sump pump with the belt off or, on a wet sump engine, remove the dis­tributor and install a suitable pre-lube tool to engage and spin the oil pump. It is best to use a heavy-duty 1/2-inch drill motor that does not overheat during the extended pre-lube period. You will feel the drill bog down and create torque when the pump first gets a bite of the oil supply. Continue pre-oiling until oil is smoothly flowing from all of the pushrod tips and lubricating the rocker arms. This indicates that all the oil passages are full and that oil has reached every internal part of the engine. This often takes some time and it is helpful to rotate the engine with a large breaker bar every minute or so to expose all the oiling passages in the crankshaft to the feed holes in the bearings. Once the pushrods and rockers are oiling you can be pretty certain the lifter galleries are full. Continue pre-oiling for another minute or two until the rockers are thoroughly covered and all air has been forced from the oil passages. Then install and pre-time the distributor and fire the engine ASAP. Remember oil pres­sure on a gauge doesn’t always mean that oil has reached every part of the engine. Full oil pressure for five or more minutes with frequent engine rotation and verified oiling at the rockers is a much safer indicator. Adjust the carburetor float levels to recommended specs. Run the fuel pump until the bowls are full and no fuel is leaking or discharging into the engine prior to startup.On carbureted engines, check float levels and fuel pressure care­fully to ensure that flooding does not occur. 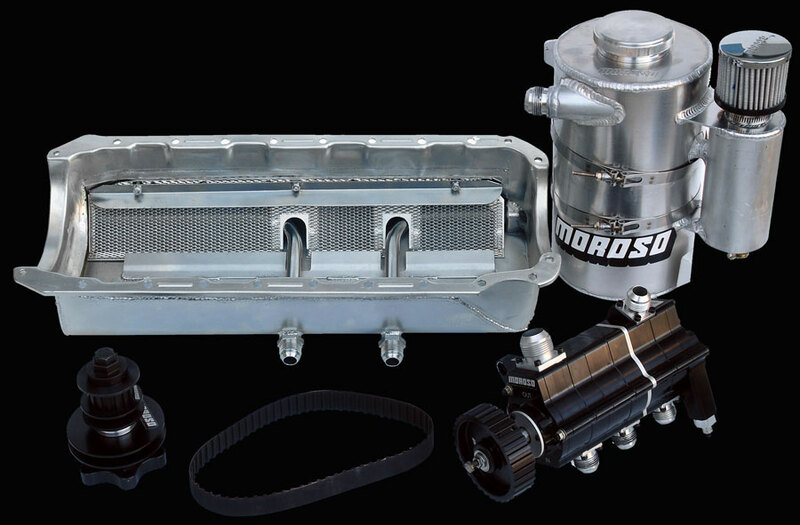 Observe the carburetor care­fully when you first apply fuel pres­sure to it to ensure that a stuck float or needle-and-seat assembly does not cause overflow into the engine. Visu­ally verify this on each venturi bore. Don’t pump the throttle to observe accelerator pump operation. A very slight stroke to verify pump shot is sufficient. The engine should start with as little fuel in the manifold as possible to prevent fuel wash on the rings and cylinder walls. For EFI applications, verify cor­rect fuel pressure and check for line leaks and injector leaks. A stuck injector could flood the engine so turn off the pump as soon as you ver­ify pressure and check your gauges to see if they register fuel flow with the engine off. Don’t turn the pump on again until you are ready to fire the engine. 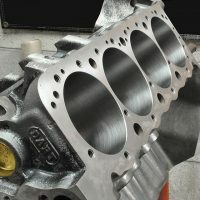 Although most gaskets do not require a re-torque after initial fir­ing, many engine builders still prefer to re-torque the heads. There is no hard-and-fast rule here and it often boils down to personal preference. If you do prefer to re-torque the heads you must wait until the engine has cooled to room temperature. Hot torquing only leads to false results and could cause engine damage. 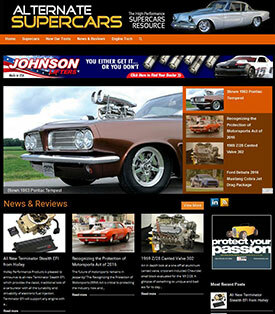 A regular maintenance program can help ensure the health and lon­gevity of your racing engine. With the exception of unexpected cata­strophic failure, engines normally exhibit distress symptoms that indi­cate the onset of potential problems. Regular checkups and maintenance catch these indicators and help you preserve engine performance. Keep a logbook and note critical symptoms and abnormalities after every event or at some reasonable time later. In addition to logging the number of miles, runs, or laps, check and record the following regularly. One of the easiest checks to make is ignition timing. Check tim­ing before and after an event. Testing should have established the engine’s preferred timing setting. Check it prior to every event to make certain that the engine performs as expected and to verify that the distributor or crank trigger has not been accidentally moved in the shop or during transport. Checking timing before a race verifies that the ignition system is function­ing properly. Checking it after a race may reveal potential problems. A simple mark on the distributor housing and the manifold indicates your preferred setting. If it has moved during the race you may have failed to tighten the distributor clamp or the crank trigger pickup securely. The crank trigger may have been struck by track debris or it may have moved because of a vibration. If the checks seem correct but the engine timing still fluctuates, you may have a worn or failing timing chain, loose components in a gear drive, or slippage in the adjustment mechanism on a belt drive setup. A failing cam or distributor drive gear could also contribute to unexpected timing changes. Investigate timing abnormali­ties carefully to determine not just the change, but also what caused it. A loose distributor or crank trigger pickup is one thing, failing parts is quite another. If timing seems in order, pull the valve covers to check the springs and valve lash. Take note of the condi­tion of the residual oil in the cylin­der head. Look for debris, water, or any radical color change. Oil natu­rally darkens with use, but it should still exhibit some level of transpar­ency and no debris whatsoever. If in doubt, try to identify the problem. Don’t just change the oil and hope it clears up. It won’t! This is a good time for another filter check. If the condition of the oil is sat­isfactory you can begin checking springs and valve lash. Examination of the oil in the cylinder head should only take a moment or two so the engine still has temperature in it for the lash check. Log each lash setting in your notebook. Operational changes in valve lash can indicate spring problems or potential failure in the rest of the valve train. Any change of more than .002 inch should be investigated carefully. Modern valve train com­ponents for racing engines are very good. They tend to maintain lash set­ting very well unless aggravated by other influences. If the lash is mov­ing around, get to the bottom of it or else the engine will ultimately expe­rience a catastrophic failure. Normally, lash may tighten slightly as the valve settles into the seat, but this should be no more than .001 to .002 inch. If the lash is tight­ening more, you may have a valve or seat problem or a valve lock that is moving in the retainer. Investi­gate. If the lash is opening up, you may have loose components, push­rod deformation, or a failure in the roller lifter assembly, a rocker arm problem, or some bit of abnormal contact between various valve train components including the cylin­der head. This may be a retainer or a lock moving around in the spring and contacting the inner surface of the rocker or any number of subtle and often hard-to-identify valve train problems that require patience and keen eyes to detect. Careful measurements and obser­vation for damage or witness marks usually reveal the problem. If in doubt, remove the rockers one at a time and carefully examine them, the valve stem tip, pushrod cup, and both ends of the pushrod for signs of distress. The initial valve lash always changes and must be re-adjusted after the initial warmup. Set the lash to recom¬mended specs as noted on the cam card provided by the camshaft manufacturer. Check for pushrod-to-cylinder-head contact or guide interference and evaluate the contact pattern on top of the valvestem. Examine the roller and bearing and check for contact marks on the bottom of the rocker. Valve lash distress could also mean problems with lifter or push­rod rotation or a loose roller lifter tie bar that is allowing a small degree of lifter rotation on a roller lifter. This leads to massive failure pretty quickly and is certainly worth inves­tigating even if you have to pull the manifold. If you don’t observe any valve ­train problems, check the springs and log their pressures. Your logbook should have a record of spring pres­sure at assembly, during testing, and after every event. Some builders like to fire an engine before every event and check springs after warm-up or practice. 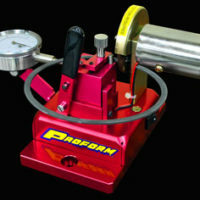 Moroso, Proform, L&K, and other manufacturers sell heads-on spring testers that make the proce­dure quick and easy. Race springs lose a slight bit of pressure and take a set after break-in and a few power runs on the dyno. Observe this carefully. As a rule, springs relax about 5 percent, but you won’t know if there is a bad one unless you check and recheck regularly. Log all spring pres­sures during and after dyno testing, during track testing, and after every event. Some racers only spot check springs, but that’s not good enough for a precision race engine. It only takes a few moments longer to check and log every spring. When you find a weak spring, it is likely time to change the whole batch. Others may be on the verge of losing pressure or failing on the very next lap or run down the drag strip. Why take the chance? Besides, springs that don’t hold pressure are probably not controlling the valve properly and performance degrades prior to failure. If the valvesprings can’t control the valve bounce, you’re not getting all the power available from your race engine. An oil filter check should be per­formed after every race. Purchase a filter cutter and open the filter for examination. Pry open all the pleats and check for debris. If you find any, determine the likely source depend­ing on whether it is aluminum, iron, silicone, gasket material, dirt, or oth­erwise. If you use a Filtermag (and you should) check the inside of the filter canister. Excessive magnetic material here may indicate a looming failure somewhere in the engine. A very light spread of metallic particles is normal, but be wary if the pattern of trapped particles seems excessive. If you run an Oberg-style screen filter examine it closely for material. This is also a good time to exam­ine any engine magnets you may have placed on the heads or lifter valley to see if they have collected any ferrous material. Any time you find a significant amount of col­lected material, consider it a warn­ing shot and get to the bottom of it. 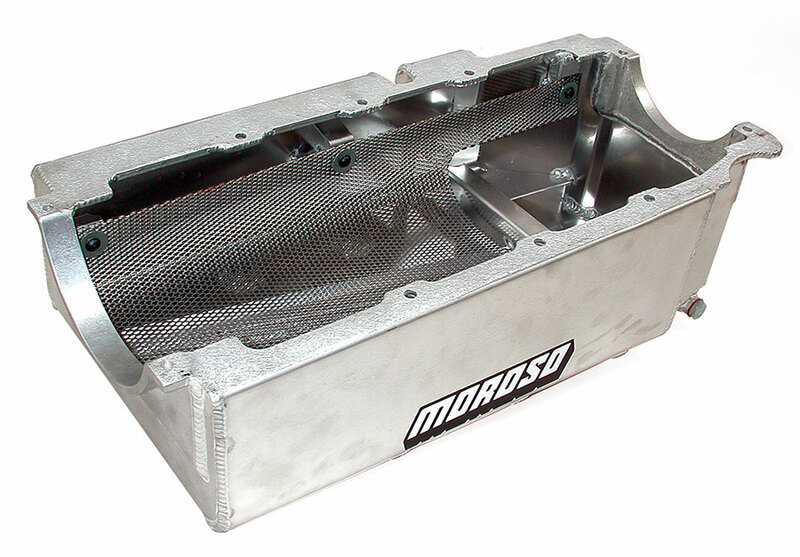 Some racers have been known to attach small magnets to the exterior of their dry sump tank near the out­let to the pressure pump to catch metallic debris before it can enter the pump. Examine the oil you drain from the engine. If it smells burned and no longer feels slippery, a prob­lem may lurk within. You can’t change the oil often enough, but it won’t save the engine if the prob­lem is serious. You have to find the source of the debris and correct it, if it’s not already too late. If an engine has been run hot, numerous problems accrue. Exces­sive component growth may have caused damage via contact with other components. It causes bear­ings to lose their crush and spin. It also causes fasteners to relax and lose torque, particularly cylinder head and intake bolts. Check cylinder head and manifold bolt torque and log them in your book. If the engine was only slightly overheated and corrected relatively quickly you may have dodged a bullet. If it really got hot, consider yourself lucky to have escaped with all your parts still inside the block. 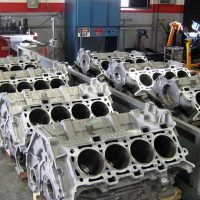 Cylinder walls may be scored, piston skirts galled, and numerous other problems are likely present. A full teardown is warranted. 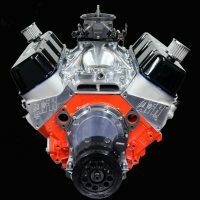 After each race many builders take additional steps to preserve the integrity of internal engine com­ponents. One popular practice is to back off all the rocker arms so that no rocker arms or springs are in com­pression between races. This releases all valve springs to their normal seat pressure. It is good practice since a stored engine always has some valves partially or fully open, which can place full valve spring pressure against any given retainer, rocker arm, and/or related components. Another favored procedure is to per­form a full leak down test while the engine is still warm. This provides an immediate indication of the engine’s post race health and can indicate whether damage has been sustained during the race. Careful leakdown procedures can pinpoint potential problems specific to any given cyl­inder and suggest the nature of the problems and how you should pro­ceed. Consider it good insurance for any high-dollar engine. 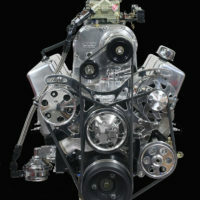 An example might be a turbocharged high-boost engine that has just completed a run at Bonneville. No doubt the engine builder would like to verify every cyl­inder prior to the next run. Other post race techniques include cylinder lubrication to pro­tect the cylinders between races. 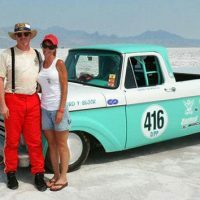 Some builders like to crank the still warm engine while spraying WD-40 down the carburetor to lube the cyl­inder walls. Not all builders subscribe to this technique, but it is hard to see how it can do any harm unless the engine is stored for a very long time. Others like to cover the exhaust col­lectors or stuff rags up in them to pre­vent moisture from finding its way to the valves via the headers. Another popular and essential post-race procedure includes fuel pump and fuel system maintenance. Depending on the length of time between races, race gas can gel in the pumps and lines, clogging them and leaving harmful residue that could later clog injectors, jets, needles, seats, and so on. Post-race procedures often include running some pump gas through the fuel system to remove all the race gas. Running pump gas through the system flushes the fuel supply and ensures that all compo­nents function properly on the next startup. The engine will not object to this under low or no load condi­tions. After this step it is also a good idea to clean or change the fuel fil­ter and, depending on the length of time between events, you might also consider draining the carburetor float bowls. These steps are more important than you might suspect, especially if there is a lengthy period between races. And of course all of these steps should be performed if you are planning on storing or shipping the engine. 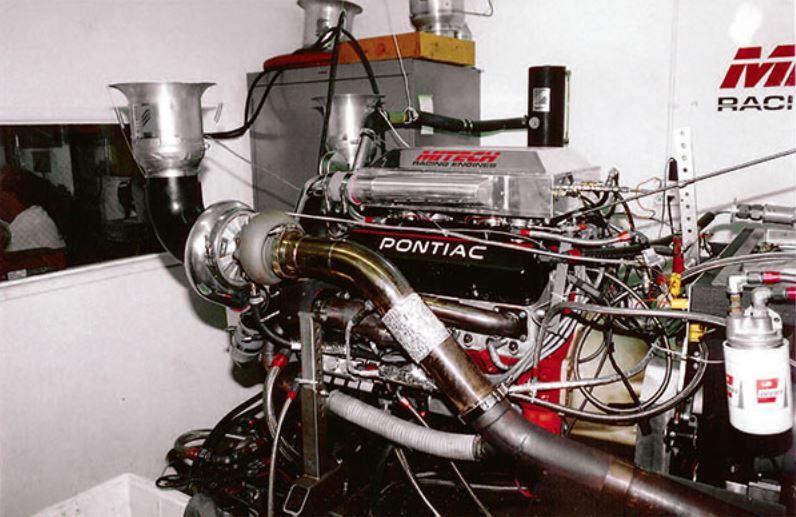 All racing engines should be tested and broken-in on an engine dyno. Dyno testing fosters proper engine break-in procedures and it makes it easy to spot and correct potential problems ranging from valve train issues to simple oil leaks. Most top engine builders insist on dyno testing to certify their work. Even independent builders not equipped with their own dyno facil­ities take their engines to a repu­table shop to check and validate their work. It’s important to remember that the dyno is a comparative device whose accuracy is only as good as the data used to program it. It requires accurate atmospheric data and consistency of operation. You can’t really compare power numbers from one dyno to another because there are too many variables. Stick to one dyno source and make sure it is well maintained, regularly cali­brated, and competently operated. Make sure the operator follows your instructions and records the data you are seeking. Most dynos are capable of recording every possible bit of data about your engine if equipped with the proper sensors. Consistent testing procedures and spot-on calibration are imperative. Because dynos often “seem” to give consistent results, some operators become complacent and fail to regu­larly verify proper calibration. Many dyno operators are capable of pro­viding considerable help and insight about how the engine is performing, but the best ones ask you exactly what you want every step of the way. A dyno operator who doesn’t really listen to you probably isn’t qualified to test your racing engine. Never let the dyno operator rush you. A dyno operator who is more concerned about lunch or what time he is going home probably isn’t concerned about properly evaluating your engine. Don’t wear the engine out on the dyno. Do most of the initial testing at or below the torque peak while estab­lishing optimum spark and jetting. Ask the operator for a full printout including all of the raw, uncorrected numbers. The correction factor means very little to most engine builders; the uncorrected number is what the engine really delivers for any prevail­ing conditions. The uncorrected data establishes a benchmark and permits accurate analysis of fuel usage and BSFC numbers. If you’re seeking or selling numbers the correction factor is your co-conspirator. If you’re an engine builder validating your com­bination, uncorrected numbers tell you everything you need to know. The chances of the engine run­ning with the same conditions as the correction factor are slim to none, so what’s the point? Magazine testers use corrected numbers because they are impressive. 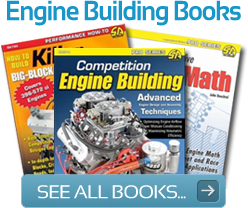 Real engine builders glean everything they need to know from the raw data. Most dyno facili­ties can provide you with a disk or a a thumb drive of all your data plus a simple software program that allows you to read, graph, and evaluate the tests on your home PC where you can study them at your leisure. Consistency in how the raw data numbers are obtained is impor­tant. Well-maintained dynos are very repeatable tools as long as the operator maintains consistent envi­ronmental conditions and runs all the tests at the same oil and engine coolant temperature and repeatable atmospheric conditions. Many operators insist on run­ning tests at coolant temperatures far below actual race operating con­ditions. To some degree this is a function of the dyno cooling sytem, which is not often adequate for running at race engine temperatures. You must decide what serves your needs best and try to test at a tem­perature that works for you. Since dyno tune-ups rarely trans­fer well to the track, it’s generally not necessary to pursue absolute power numbers on the dyno. Its more immportant to establish the engine’s operational health and to generate data that allows you to verify the powerband and how well the engine meets your requirements. Testing at lower temperatures makes it easier to generate big power numbers and the operator doesn’t have to be as careful. Experienced dyno operators can quickly spot any inconsistencies and verify whether they are due to the dyno or an engine problem. More often than not it’s not the dyno but rather a tuning or mechanical issue that can be pin­pointed by thoughtful evaluation. In a sense, repeatability is more important than accuracy. If the dyno reports that you made 825 hp, you can’t really be sure if that is a truly accurate number. But if it repeats within 1 hp over and over then you’re accomplishing something because you can accurately judge the effect of any changes you make. 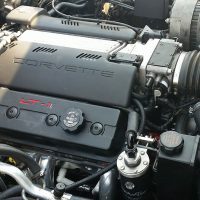 The engine may actually only make 795 hp, but if it repeats and shows you gains or losses from your benchmark, the specific number is less critical than the degree of gain or loss and what the instrumentation tells you about fuel flow, air/fuel ratio, EGTs, and other factors that relate accord­ing to the changes made and the sub­sequent results. One important factor is the data filtering method used to smooth the curves on test graphs. Those smooth curves look impressive, but in real­ity a “zoom in” of the data reveals numerous peaks and valleys in the overall curve based on inconsistent fuel delivery, mixture quality, igni­tion scatter, and other intermittent interference all affecting the quality of the measured power curve. Dyno testing can easily go on for­ever if you don’t establish some goals and parameters. 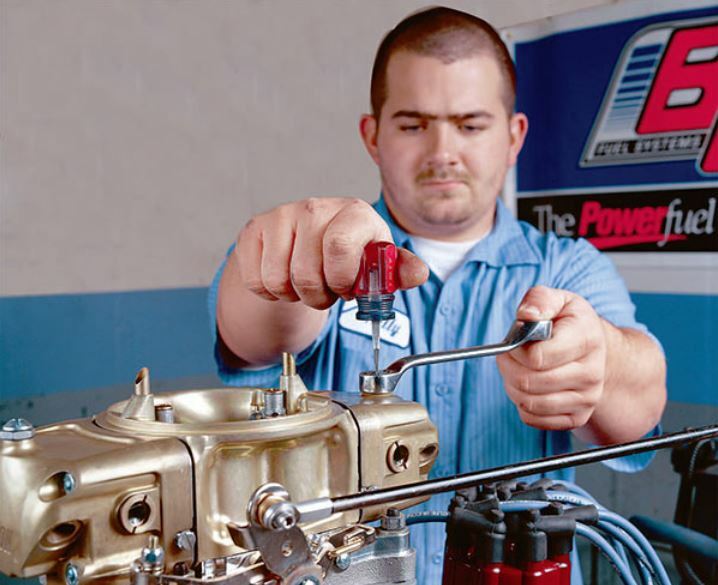 Unless you are test­ing different cams, carbs, manifolds, or headers to ascertain the differ­ences, you’re better off focusing on establishing the engine’s powerband and the operational integrity of all the critical components. Don’t rush the testing. After the proper break-in and fluid changes, do some check­out pulls at a safe RPM and examine the valvetrain carefully for signs of distress. When you are absolutely confident of the engine’s mechani­cal integrity you can make a couple short sweep tests across the range of the anticipated torque peak. Once you pinpoint it, you can begin evalu­ating fuel ratios and spark settings. Since the torque peak is the point of highest efficiency, tuning efforts here establish the optimum spark lead and jetting requirements that allow you to fine tune the top end with the high-speed air bleeds. Don’t beat the engine to death on the dyno. You’re going to have to establish a track tune wherever you go so it’s relatively pointless to tune the engine repeatedly on the dyno. Once you know the engine is healthy, pack it up.